In the history Sanskrit literature Bhavabhuti is ranked second only to Kalidas as dramatist-poet. His three plays present an unequal literary phenomenon. But his Uttaramacharitra is his masterpiece and a treasure of Sanskrit literature. Bhavabhuti writes with passion and emotion like a poet. His language is the language of powerful feelings and has all the splendor of rhetoric. He expresses his content with abandon, but often reaches life at its very core. The present monograph is quite comprehensive and it encompasses the personality of this poet-dramatist, his life and times, the literary trends, the merits and shortcomings of Bhavabhuti's writings, besides a thorough study of the three plays and of the thought world of Bhavabhuti. 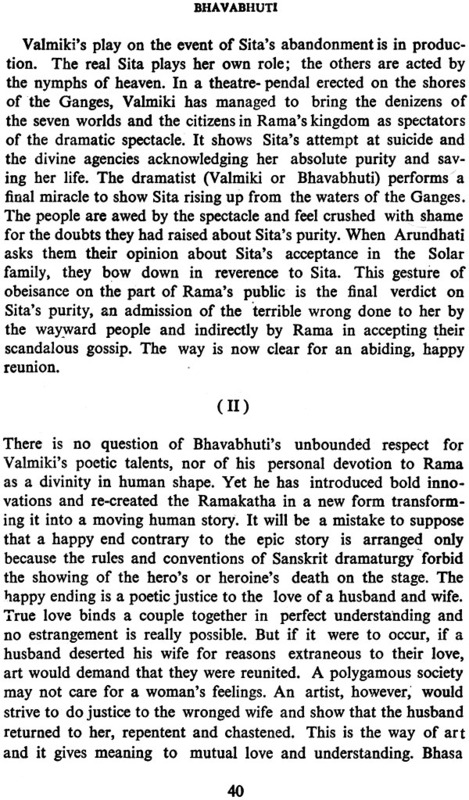 G.K. Bhat, the author of this monograph is a retired Professor of Sanskrit and Ancient Indian Culture. Currently he is Curator and Director, Post-graduate and Research Department, Bhandarkar Oriental Research Institute, Pune. He has a number of Literary, Critical and Research articles and books in English and Marathi to his credit.